Phil Steele not only produces the best football magazine, but maybe the greatest magazine of all time on any topic. Granted, the Phil Steele college football edition only comes out once a year, but the wealth of information in this thick magazine surpasses that of any publication I’ve ever known. Unlike pro sports, college football has over 100 teams in the league! What’s more, the players in college football change every 3-4 years as they graduate and move on. The recruiting season takes place only a few months before later summer football practice begins and long before the actual rosters have been announced. One has to wonder how a football expert or group of experts can know so much about every team and get it published before summer camp begins. 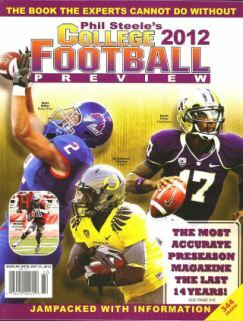 Phil Steele delivers more than just a wealth of college football information; but the most accurate forecasts. Other college football magazines don’t even come close. If it seems like I am being a little harsh or exaggerating then you simply haven’t compared Phil Steele’s with the rest of them. All college football magazines publish statistics, rosters and their predictions for the upcoming season, but Steele takes it to a new level. Steele not only provides statistics and predictions, but gives interesting and meaningful incite and stories to help you make your own conclusions. Even if you don’t use the magazine to help you predict the games, you will enjoy reading about all of the conferences, teams and players. It really is amazing that there can be so much information packed into one publication each and every year. Phil Steele is hands-down the best football magazine on the planet. If a more comfortable bike ride depends on finding the most comfortable bike seat, I figured that would be some shopping time well-spent. I made it my goal to find the most comfortable bicycle seats made – money is no object. Think about the physics of bike riding: We put the entire weight of our body on our seats. If the weight and gravity aren’t enough, the constant strain, pressure of pushing down on the bike pedals is asking a lot of our rears and bicycle seats. 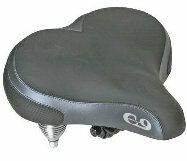 Is it even possible to be completely comfortable on a bicycle seat and are the most comfortable bike saddles the same for everyone? Summarizing detailed reviews of bike seats would be difficult because we and our butts, all come in different weights, shapes and sizes. Due to the various contour, shapes and sizes of different bike seats, the most comfortable bike seat for one may not be the best for another bike rider. It would be helpful to find one bike seat with numerous and favorable reviews by a large number of users with different sizes, weights and shapes. As luck would have it, I was able to find such the most comfortable bike seat. You will not find a more comfortable bike seat with as many favorable reviews by such a large number of users as the Sunlite Cloud-9. 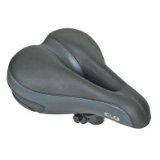 The Sunlite Suspension Cruiser Saddle was rated 4.5 stars on Amazon by 50 users. That’s a darn good rating – and if you take the time to read through the reviews, you’ll find that the bike riders were generous about mentioning their size and weight and why they felt the Sunlite Cloud-9 is the most comfortable bike seat they’ve ever used. Users of the Cloud-9 range from 5’2, 100lbs to over 6′ tall and 250 lbs. The majority of users specifically stated that this was the most comfortable bike seat they had ever used. There were a few negative comments. So, what is not to like? A bike seat that fits everyone tends to be on the large side. If you’re an athletic bike rider looking for agility on curvy, twisting roads or balance on rocky, bumpy mountain trails, the Cloud-9 is probably not for you. But then, the most comfortable bike seat is not intended for sports – the Cloud-9 is built for comfort. The Sunlite Cloud-9 Comes in a few slightly different flavors. There is a sport version and suspension cruiser saddle version. If you want something comfortable, for those winding roads and/or bumpy trails, go with the sport version which will provide better balance and agility. If you want the most comfortable bike seat – PERIOD – go for the Sunlite-9 Cruiser Saddle version. Without going into details about each and every one of the DVDs, suffice it to say the entire, 90-x routine is a massive, exhaustive and intense combination of Cardio Vascular and Strength training routines, ranging from 40 to 90 minutes. (It helps to have some additional products and equipment such as dumbbells, bars and/or resistance bands.) The goal is to do a different module every day and end up with an incredibly strengthened, superior toned body in just 3 months. In reality, the 90X system is really not much of a home fitness program at all, but more on that later. How does the program work? Is 90X a Weight Lifting or Cardio Program? Host, Tony Horton, keeps 90-X fun and fresh with his enthusiasm. The 90-X Workout is neither strictly a weight lifting workout nor a Cardio workout; it is a combination of both. 90X utilizes a technique called Muscle Confusion, though some refer to it as, insanity. Essentially, the idea is that every single muscle in your body gets used. Where-as other exercise routines get you to a peak in your performance and growth over time, a 90-X Workout makes use of hundreds of maneuvers and routines, so new muscles are being used and developed every day. Consequently, your body will continue to progress and strengthen even after several months of using the program. The other benefit is that not only will your body not reach a plateau, but your mind will not grow bored. Some of the routines are more geared for muscle-growth and others are for cardio performance, training and endurance. Of the 12 P90X Routines, you can mix and match the ones which suite your needs and goals for the kind of body you want to have. The 90X system includes the 12 Workout DVD, a Training Guide on how to use them to your beneft, and 3-Phase Nutrition plan. The goal is to use the DVDs for at least one hour every day. I guarantee you that is more time than most people spend on exercising, so it would be hard to imagine a Fitness Program like this not actually working if you stick to it; and there-in lies the rub…can you stick to the vigorous workouts?